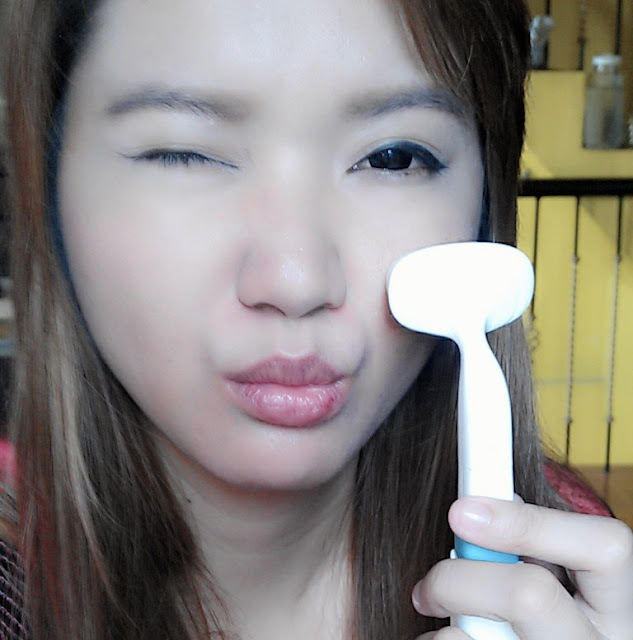 So having this pore cleanser is like having my own derma/facial tool at home. Almost. I guess. haha! ┐(￣ヮ￣)┌ And I am so damn happy that I can now wash my face before going to sleep with this magical thing-y without feeling SUPER LAZY! Product Description - Soft sonic vibration cleanser that vibrates 20,000 times a minute. - Soft micro fine wool of 150,000. - Clean cleansing is possible with only foaming cleanser and natural bubble sonic pore cleanser. - Takes care of dead skin cells, impurities, make-up, and black head. - Men with abundant sebum also can use while washing face. 1. Put some water on the brush and put cleansing foam on it. 2. It will start vibration once you press on button. 3. Start to cleanse the face with auto natural bubble sonic pore cleanser. 4. Wash off with cold water to tight pore. As you can see on the photo, the bristle on this brush is very dense and compact. The only thing that worries me is how I'm going to deep clean this brush. I'm scared that I might damage the brush if I try to go through the roots of the bristles. I will try to update you on that. It is sold for $39.99 at TWOFACEMALL. Very affordable compared to other brands and shops. Plus the shipping is FREE! Interesting product! Is the price in USD? I wonder if they sell it in the local TONY MOLY stores and stalls. I hope they do! Is that 40USD?? Coz wow that's really good if it is!! This seems somewhat similar to the Clarisonic and I've been dying to try a cheaper alternative to it!! I'm going to have to look into this product for sure!! nice! :D thanks for the review! AHHHHH!!! Thank you so much for sharing this! I want one!!! Wow the bristles are so fine that it looks like a sponge! Haha, this looks like a great alternative to the clarisonic! hi, Can you get the replacement brush ?